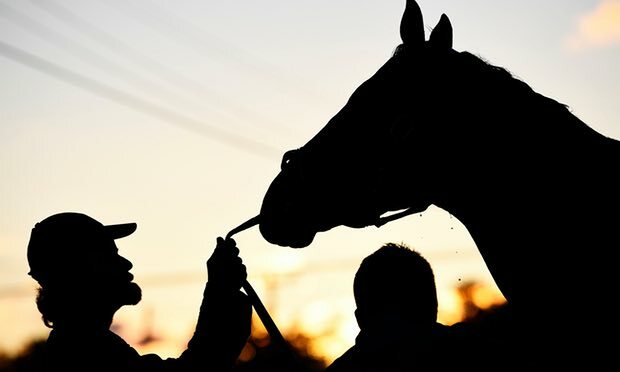 A dark cloud has been hanging over the Kentucky Derby this weekend as horse trainers have made public their anger at Trump’s immigration policies, which they say are hurting the Kentucky Derby, the US’s most glamorous horse racing event. The horse racing industry is big business in Kentucky. It brings more than $4bn a year to the state. The owners of horses at Churchill Downs racetrack are among the country’s economic elite; derby winners can bring in purses that easily exceed $1m. But the race, and the work of the wider industry, rest largely on the backs of an immigrant workforce making on average $400-$600 a week as well as free lodging in a huge dormitory inside the Churchill Downs complex. The skilled work typically requires a regular crew of guest workers, who live in Mexico in the offseason. However, as a result of Trump’s immigration crackdown, many horse workers were unable to make the trek to Churchill Downs this year. Horse owners have spent the week criticizing the effect that Trump’s immigration policies have had on this year’s derby. “There’s a lot of uncertainty about whether or not we are going to have the labor force we need,” Dale Romans, the second-winningest trainer in Churchill Downs’ history, told the UK’s Channel 4 News this week. To check out the full piece go to the Guardian. Be the first to comment on "Kentucky Derby 1% Denounce Trump’s Immigration Policy As Horse Worker Shortages Hits Them"